Ok now that I have that Bare Naked Ladies song playing on a loop in your head (link at end of blog for the musically challenged)….. It HAS been one week…..since The Night Shift Season One Finale. TV shows are a dime a dozen. Youtube has exclusive shows, as does Netflix, Hulu, the myriad of cable channels and of course the standard networks in each country. Quantity has overrun quality in programming and it has disheartened me as a viewer and as a creator. I want to enjoy quality when I watch – be it laughter or tears inducing – and in the case of The Night Shift – both of those. Even relaxing, escaping, seeing and feeling from new vantage points via media …or why ever I am watching a program or film, I want it to be worthy of my time, and mind, and emotions. The Night Shift delivers. Big time. Every time. The premise of the show sets it apart from other medical dramas. The writing is an exquisite balance of laughter and tears, pain and joy, realistic situations and the nearly unfathomable that ONLY occurs in a night shift ER. The directing and producing clearly is on par with the creation quality as every episode – even delivered via different amazing directors – maintains the same quality and for the audience’s sake – the same familiar flow of feeling and experience. The acting…. what follows that direction and brings that writing to life…. The acting is SO phenomenal (and for this somewhat jaded Hollywood chick to say that… you can take my word for it without reservation). As I detail the main cast…the supporting cast is just as amazing… specifically the lovely nurses… Heather played by Catherine Pilafas, Molly portrayed by Esodie Geiger, and Jocelyn brought to life by Alma Sisteros. Talented women who bring such personality and texture to their ‘supporting’ roles, I’d love the future seasons (yes that is plural… you heard me NBC!) to explore their stories as well. Robert Bailey Jr. brings a sweet blend of innocence, ambition, and heart to his character of intern Dr. Paul Cummings. In the finale I loved seeing how his love and respect for Topher pushed him through his student mindset and into doctor mode, prioritizing what his mentor-patient needed over his own comfort zone. Robert you are such a gifted young man….as I posted on Twitter, you turn every #PoorPaul moment into a #PreciousPaul delight. And…. Your duets with Jeananne… wow… just wow… I’m expecting to hear lots more from you musically as well. (Listen to one of the duets Robert has done with Jeananne here). What a treasure you are. Was a joy to meet you and hope to again one day soon. JR Lemon – Kenny, Kenny, Kenny… The handsome, sweet, funny and dedicated ‘murse’ (male nurse). Loyal supportive friend, adoringly crushing on Krista, and somehow right where he is needed… coming through the door or around the corner right in time. Very aligned with the methods of the military docs on staff, Kenny will do or facilitate doing what is necessary to help someone…rules or not. JR brings his own mischievousness to the role, along with his own intrinsic sweetness. He lights up the screen no matter if the scene is serious or has us in stitches… the laughing kind that is. I cannot wait to see how his character develops, and see his relationships develop. His friendship with TC and Drew are what we all hope our friendships to be – loyal, fun, supportive, and steadying. Kenny helping Ragosa with his online dating profile was priceless and of course watching Kenny as he watches Krista… well that sure seems as if it is just a matter of time. JR you really have a brightness to you, an energy that is magnificent on and off screen. Was a lovely surprise to meet you at Eriq’s book signing…and next time…I’m bringing a better camera J.
Brendan Fehr plays Dr. Drew Allistair. A military man who was until recently secretly gay. So many possible repercussions could unfold from revealing his personal life, and Brendan does a fabulous job navigating the role. It’s painful to hide who we are no matter what secrets we hide, and Brendan showcases the inner turmoil without bitterness or rancor. Love… for his partner Rick, and from his good friend Krista, propel Drew to prioritize what is the most important above all… above social or professional fallout, above challenges in the military, above his own discomfort… and he stands by his man. The scenes between Drew and Krista are so intense and intimate in the depth and scope of their friendship, it often feels like I am intruding on a private moment. I’ve seen Brendan in many roles before this one and he has always been a good actor. In this role as Drew, Brendan has expanded to all new dimensions of his craft. Jill Flint is beautiful, brainy, and a bevy of other fabulous things. Jill’s character, Dr. Jordan Alexander faces a lot professionally on the Night Shift… mentoring the interns with a firm yet loving approach and pride in their growth and accomplishments, the tenuous balancing act between the corporate side of the hospital, placating Ragosa, and doing what she feels is best for the patients which often entails bending rules and supporting the maverick like approach of ex-boyfriend TC. The cases that come in to the Night Shift are a lot for anyone to handle emotionally and medically, and when one has to face all that… plus work with your ex’s current/ex ‘interest’, all the while having your mind and heart play tug-o-war between your current boyfriend – upstanding surgeon and new Night Shift ER Chief Scott, and TC, the impossible to ignore, more than slightly damaged and damaging ex…sheesh – I’m exhausted just writing that list… Jill Flint is truly and remarkably relatable as a strong, ambitious, yet still human, and vulnerable, woman. Most strong female leads have such an edge that you can feel some of their own emotions have been sacrificed for their strength. Not in the way Jill portrays Jordan. She is admirable, relatable, and emotionally evolved enough to process her feelings, function, and flourish. Jordan is what every ambitious little girl should seek to grow up to be… and that is to the credit of the amazing actress who plays her. Freddy Rodriguez has blown me away this season. A fantastic actor that I have enjoyed watching in many other roles over the years, Freddy started this season as a character that at best I thought I’d love to hate. Even in the pilot episode he presented his character, Michael Ragosa, the hospital administrator, with the duality of being the cold cut throat businessman, and yet also a man with fears, challenges, and … a heart. As the season progressed, we came to know… and even love Ragosa. His insecurity based cockiness, his business management, how he impressively handled staff and patients in times of crisis, and of course his love life woes of all kinds past, present, and hoping for future…all facets of this character that Freddy plays so wonderfully. He is equally convincing and compelling in every aspect of Ragosa, even when those aspects seem to contradict. Looking forward to seeing how he handles his own health challenges and the huge emotional and practical ripple effect it will have through the various areas of his life. Daniella Alonso was fascinating to me as Dr Landry de la Cruz. Here she was strong, smart, and the onsite shrink for the Night Shift, and yet she was ‘playing doctor’ with co-worker TC, who tempting as he may be is also complicated as heck. There had to be aspects of her past that created her inner need to compartmentalize and keep aspects of herself detached. When her estranged father enters the ER we start to get some insight into what has built her character over the years. Beautiful irony that the presence of her father, clearly part of what shaped her to be as she is today, is also what brought her to the end of her rope as being TC’s “insignificant other”. Love life aside, Daniella brings us Landry as an intricately blended woman of strength, compassion, fears, logic, and longing to be safe and loved. Very well played. Ken Leung – I have to say it… I want a Topher in my life.. a fabulously brave, calm, wise, loving friend. Mentor, friend, doctor, father, husband…so many hats are piled on Topher’s head and yet he remains calm, caring, wise, and brilliant. Ken Leung has been a long time favorite of mine, and I am glad Topher survived, so that I can keep enjoying this great actor’s work – week after week in season two and beyond. Eoin Macken – Oh man… this is where it gets difficult for me. So much to say and so tricky to refine it into what should be said here. I will start with what would normally be the end… As I said on Twitter the night the finale aired… if this show, and specifically Eoin Macken does not get an Emmy (or two or ten) for at least this final scene of this season then NOTHING ever should. (Watch the future Emmy winning scene here). 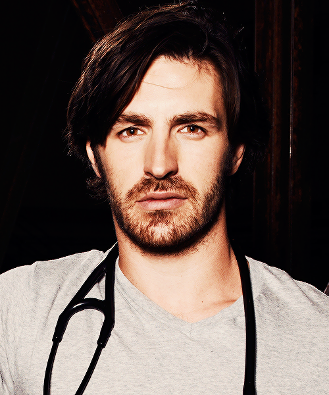 There is brilliance, there is talent, there is complexity in approach to a role… and then there is Eoin Macken as Dr. TC Callahan. This show is multi-faceted, this role is multi-faceted, and then Macken just takes it another several leagues beyond that into depths that are often hard to watch. It is visceral and real, and amusing and painful, it takes you back in his painful memories and keeps you present as it affects him – and the viewer – all in the same moment… AND often by facial expression alone. When you watch someone ‘act’ and you see a man emoting through his experiences (be they PTSD or a faceoff with a cocky current boyfriend of your ex)… you have to step back and realize greatness when you see it. Watching TC is watching someone in front of you live, breathe, speak and feel every bit of pain, friendship, adrenalin, intent to heal, loyalty, love, passion, and vulnerability that he goes through. You never feel you are watching someone do a great job at merely portraying that. Eoin seems to step into the skin of his character and breathe its breath and speak its truths, and feel its feelings… so authentically everyone watching is IN the moment not just watching it. The character of TC is complex… as I said above – both damaged and damaging….headstrong AND heartstrong….tough and vulnerable, cocky and sensitive. His truest strength is shown in his moments of deepest emotional expression. Eoin’s portrayal of a vet with PTSD is right on the money. The PTSD clients I have worked with have agreed with that when I encouraged them to watch this show. I could keep prattling on but I would never adequately express what can only be experienced by watching Eoin as TC…. There are no words… well maybe one… EMMY. I REALLY hope NBC is wise enough to air reruns through the late summer and fall programming and also to get The Night Shift out on DVD and/or BluRay ASAP. It would make a fabulous holiday gift and get viewers hooked on The Night Shift to resume watching when it returns with season 2. Writers, Directors, Producers, Crew, and CAST.. THANK YOU… you have given me weeks of enjoyable viewing and revitalized my faith in programming. You amazing folks ROCK! Bare Naked Ladies “One Week” as promised above – unrelated to the show just… blog title prompted… Listen here. It’s so ironic… when a show or film is mediocre to dismal, I can write about it instantly, whereas when I fall ‘truly madly deeply’ for a show, I procrastinate, trying to do it justice and yet not sound SO besotted as to not be taken seriously. I needn’t have worried so much, my ‘procrastinating’ turns out to have been serendipitous timing, as today, FINALLY NBC announced the premiere date for “The Night Shift”. 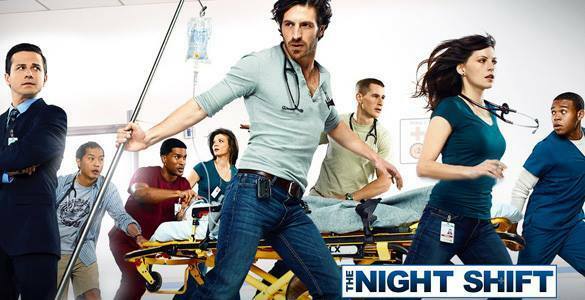 As per “The Hollywood Reporter”, THE NIGHT SHIFT premieres on NBC on Tuesday, May 27 at 10pm. At last TV programming seems to be ‘shift’ing gears indeed. With so many reboots, and spinoffs, both from former TV shows as well as from films, it is refreshing, and for this media-lover, a relief to have something NEW to watch, enjoy, and get thoroughly engrossed in. New characters, new scenarios…. At the end of this blog I have added the official NBC show description. 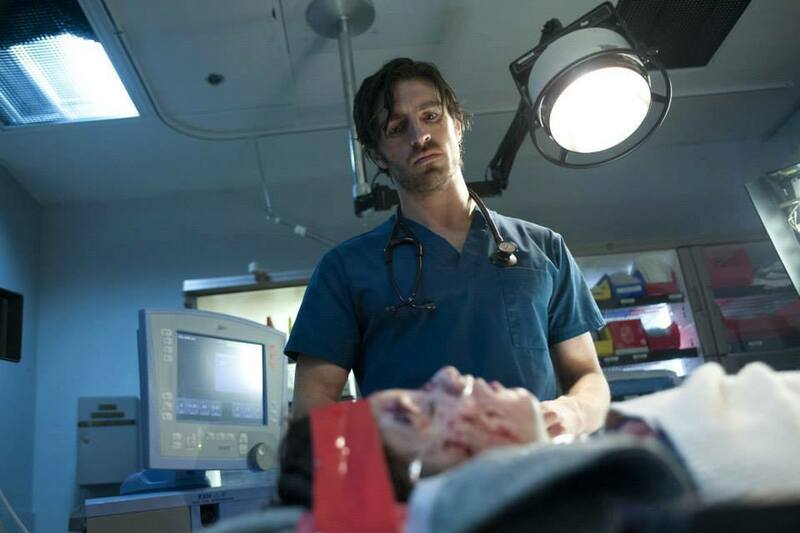 YES, The Night Shift is indeed a medical drama, but to quash any of the already over-debated comparisons to ‘ER’ and/or ‘Grey’s Anatomy’, let me share MY perception of why this new med series is a true ‘life saver’ for TV viewers. Night Shift is full of richly multi-faceted characters, brought to life by some fabulously gifted actors. There is humor alongside heart wrenching stories as one would expect to see in such a program. There are friendships, failures, success, and foibles, complicated working relationships… there is life. It feels real, not contrived. Actually that is it in a nutshell…it FEELS… and isn’t that the point of any small or big screen production? To make us FEEL? As I watched the pilot episode, I was pleased to see that each character was presented in a manner that made evident how textured they were, how much more there was to get to know about each one, how relatable they were as people enduring life and its emotions just as we all do. The actors did such beautiful justice to the creation of their characters….the emotional range in some scenes was simply riveting. Keep your eye on Brigid Brannagh's portrayal of her character Althea. Perhaps one of the less flamboyant or entertaining characters, she brings such intense reality to a key scene for her character, that I felt every emotion triggered in her as the reality she faced went bouncing pinball machine like inside her mind and heart. You see even the prime antagonist, new hospital managing boss Michael Ragosa (Freddy Rodriguez), as facing his own challenges and inner demons. Just as he maddens you in most moments of being cold and mercenary, he also saddens you in his personal moments. Orchestrated so well that I found myself thinking, ‘crap, am I going to have to feel sorry for this guy??’. The cast is FULL of extraordinary actors, most familiar faces from other media favorites, doing a stellar job at bringing The Night Shift to life. The lead? You didn’t think I’d skip him did you? I always save the very best for last…. and I DO mean the VERY best. UNlike ER’s Doug Ross (handsome, gifted doctor, but essentially a self absorbed cad), or Grey’s Dr. McDreamy (attractive, gifted surgeon, and a cheater), 'The Night Shift's TC, another dashingly handsome doctor, is clearly BEYOND complex and a handful to deal with but seems oddly not ego driven…confidence and ethic driven, but not from a self glorifying inner space. 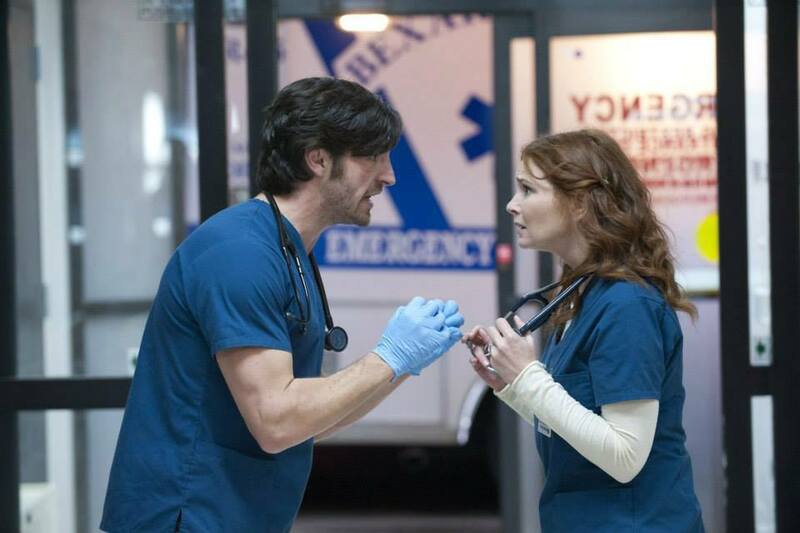 With ex-girlfriend Jordan Alexander (Jill Flint) as his newly appointed night shift boss, we get to see that TC has caused his own fair share of emotional hurt, but we also see why. The walls and layers and sub-layers of his emotions…as a dedicated, caring, and extremely skilled doctor, as well as someone who gave years in service to his country, saw and experienced unspeakable things that walk with him in every step, more alive with him than if they were mere haunting memories. So much paints the hue in which he sees life, sees those in need of his help, and molds his unwavering determination to help as many as truly (not bureaucratically) possible. The same huge heart – feeling and wise…and practical… is seen being a supportive, trusted friend and confidant, mentor to the ‘first years’, and even doing right by the ex (cue boring paperwork…watch the episode, and you will see what I am referring to). The Night Shift is fresh, it is engaging, it is entertaining, it is emotional, and it is amusing, all in the right proportions. OK NBC…. You’ve had some good programming before and you played schedule shuffle, and light promo games with those shows and they vanished. I live here in LA and I expect to see kiosks at bus stops (hey, if Singapore can have them….I’m just saying! ), on billboards (up and down Highland, Sunset…the 405.. you get the idea), in magazines… just don’t make it end up on the side of a milk carton. You have a treasure here… cherish it, take good care of it, support it….and bring it to us weekly….for MANY years to come. As promised... NBC official show description…. At San Antonio Memorial, the men and women who work the night shift are an irreverent and special breed, particularly adrenaline junkie TC Callahan (Eoin Macken, "Merlin"). After three grueling tours of duty in Afghanistan, TC is about to learn that his toughest battles will be fought right here at home. He and his irreverent team of late-night docs, including his best friend Topher (Ken Leung, "Lost") and protégé Drew (Brendan Fehr, "Roswell"), know how to let off steam with the casual prank or two, but when lives are at stake, they are all business. New night shift boss - and TC's ex-girlfriend - Dr. Jordan Alexander (Jill Flint, "The Good Wife") struggles to keep everyone in check, but TC doesn't make it easy. Paul (Robert Bailey Jr., "The Happening") is fresh out of medical school and still adjusting to the rigors of an emergency room. Krista (Jeananne Goossen, "Alcatraz"), also a new intern, has something to prove, while Kenny (JR Lemon, "Tyler Perry's A Madea Christmas") is a seasoned nurse who keeps the doctors focused and isn't afraid to break a few rules to get the job done. Meanwhile, Dr. Landry Miller (Daniella Alonso, "Revolution"), the lone psychiatrist on the night shift, finds she has to tend to her colleagues as much as she cares for the patients on the ward. Unfortunately, the night shift is now under new senior management and boss Michael Ragosa (Freddy Rodriguez, "Six Feet Under") has to balance the real-world pressures of cutting costs while battling the stigma that he is more interested in saving money than helping people.